Benue State Governor, Samuel Ortom, today flagged off the presentation of 500 start-up kits procured by the state government to youths who graduated in five trade areas under the National Industrial Skills Development Program of the Industrial Training Fund. 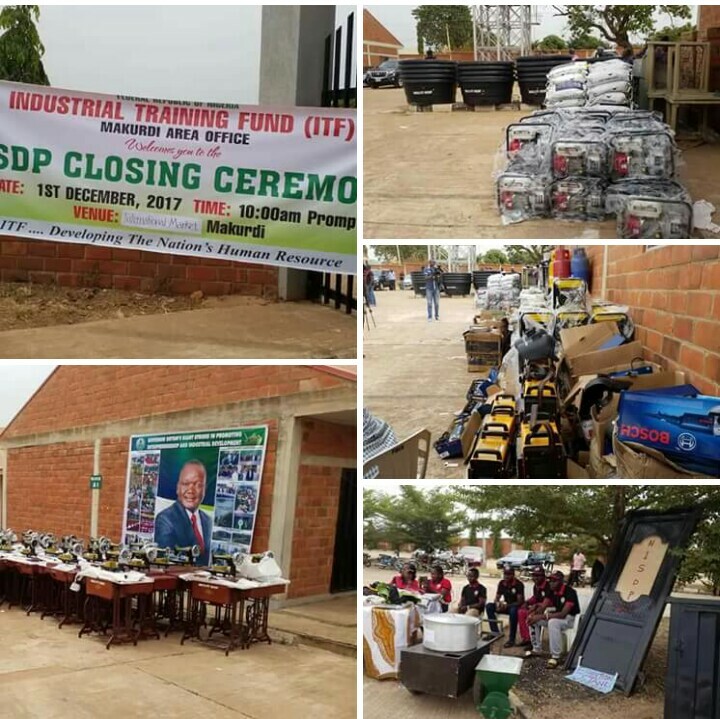 The trainees who received skills for three months in Plaster of Paris, Fisheries, Confectionery, Welding and Fabrication as well as Tailoring and Garment making were presented with Start up packs at their graduation ceremony held at the Ultra International Market, Makurdi. Addressing the graduands, Governor Samuel Ortom urged them to make good use of the opportunity provided by setting up their businesses in order to generate wealth and also boost the economy of the state. He noted that having identified skills acquisition as a step towards reducing unemployment in the state, the executive council approved the establishment of three technical colleges across the three geopolitical zones of the state to equip youths with requisite skills to add value to their lives and the society. The Governor assured that his administration would continue to partner with agencies and institutions to ensure that Benue people access skills and working capital to support their business enterprises. He said his administration was prepared to sponsor more youths in addition to those in the next round of training by the ITF. Director General of the organization, Mr. Joseph Ari, commended the Benue State Government for providing the starter packs for the trainees and enjoined them to remain committed and dedicated to making a success out of the kits. Mr. Ari stated that the agency would soon commence another training of 300 youths in each state of the federation who would be provided with starter packs by the agency and called on the Benue State Government to add another 200. Commissioner of Industry, Trade and Investment, Dr. Tersoo Kpelai, expressed appreciation to the Industrial Training Fund for the partnership and for its commitment on delivering on thir mandate. He stated that the graduates have been grouped into cooperatives for effective utilization of the kits. Two of the beneficiaries, Martins Adu and Daniel Ajonye said the training has provided them with the opportunity to become self reliant and thanked the ITF and Benue State Government for the training.